This article is taken from Asiaweek (For Richer Or Poorer), to allow our readers to revisit the issues of welfare, the aged, foreign workers, and wages in Singapore. It is quite troubling to note that this article was first published in Nov, 2000. The problems faced by those who are struggling are largely the same today – 6 years on. Lee Chong Peng is the symbol of Singapore’s broken dream. She lives alone in a one-room flat on about $3 a day. “I watch television and take short walks,” she says. “My legs ache now, so I cannot go so far.” But without fail, every Wednesday afternoon, Lee takes the lift down eight floors to the ground level of her public housing block. There she joins dozens of other poor folk from her district in Chinatown to sit, waiting, on concrete benches. Lee, 84, chats with friends, while others remain sullen, lacking even the warmth of comradeship. At 5 p.m. they all form into a line and shuffle forward to receive a plastic bag containing six eggs, 1.5 kg of rice, a can of baked beans, a can of sweet corn, one packet of hot chocolate, one packet of coffee, some cereal and a single toilet roll. Without this weekly donation from a charitable group, Lee and her neighbors find it tough to survive. In its rush to forge a manufacturing, then a high-tech economy, the city-state rarely bothered to look back at those who were lagging. Senior Minister Lee Kuan Yew developed a system based on hard work and government support for industry. Singaporeans were expected to earn their rewards. The results were astounding: a middle class emerged to build Asia’s second-richest country. But with the advent of globalization and an influx of cheap foreign workers, Singapore’s economy is becoming increasingly ruthless. According to its own statistics, the nation’s rich are getting richer and the poor are falling further behind. To most Singaporeans, the mere existence of poor folk in need of care packages comes as a shock. And this realization has prompted an uncharacteristic bout of soul-searching. The rich-poor disparity strikes right at the heart of Singapore’s development model — and challenges the city’s smug self- image. Many younger Singaporeans raised in middle-class comfort are beginning to think that Lee’s ideal is outdated; they argue that the government has a responsibility to care more for the downtrodden. How did Singapore leave its poor behind? Admits Prime Minister Goh: “Yes, the income gap in Singapore is widening because of globalization and the knowledge revolution, which have enhanced the value of talent dramatically and pressed down the wages of the unskilled.” Can the government do anything? It has already ruled out the idea of holding down wages at the top or artificially raising wages at the bottom. But where there is money, there is politics. Opposition legislators such as Chiam claim that the ruling party uses this aid for political gain — in effect, to buy votes. “The chairman of a community development council will go around like Santa Claus giving money away to the poor and unemployed,” says Chiam. “It’s the politicians who go out to give this money and of course they’ve got to get their votes. That’s the way they dish out welfare: very selectively.” The council chairman in Chiam’s constituency, the ruling party’s Andy Gan, denies that aid is used to garner votes. “Our office is open to all residents and I do not ask for their votes before seeing to their needs,” Gan says. The circumstances of Teng Ah Mui suggest that this community-based assistance is inadequate anyway. Teng, 54, lives alone and recently began receiving charity food packages each week in order to survive. She has held various unskilled jobs, but since falling and injuring her leg six months ago she now relies on public assistance. After paying her rent and utilities bills, she is left with about $80 a month. “It’s not enough, so I have to depend on food donations and help from friends,” she says. A decade ago, it might have been easier for Teng to rejoin the workforce. These days, there is too much competition for menial work and too few opportunities. Public assistance of about $115 per month. The bottom line is that the government’s willingness to help the poor is still minimal. 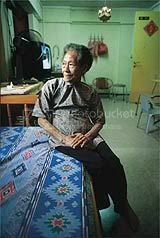 In Singapore, children are required by law to look after their elderly parents. But often they cannot do this, especially if they are low-income, single children. Admits Minister of State without Portfolio Matthias Yao: “Parents know what their children can afford. They don’t bring cases to court when they know that their children are too poor to look after them.” If neither friends nor family can help, and if the person is unable to get work, then — and only then — will the government step in with the barest subsistence-level help. Last year 2,238 people qualified for this public assistance (usually about $115 per month). The number has increased each year for the past three. So what will happen when the number of aged people quadruples in the next 30 years? They already comprise the largest chunk of Singapore’s new poor (the other major components are retrenched workers, single mothers and the disabled). Even now, rich Singapore cannot look after its older folk without drawing on the services of charity groups. Says Asher bluntly: “The government will need to do more.” If it does not, income disparities could threaten the country’s cherished social harmony. They might even eat into the ruling party’s monolithic hold on power. For now, the subject remains virtually taboo. But soon Singapore will be forced to find a remedy for its new, more disparate, reality. Just don’t call it welfare. You can also discuss the issue in theonlinecitizen BACKROOM.